Queen of Americana Kim Grant kicks off the sixth season of the Big City hoedown in style with honky tonkin’ headliner/L.A. native Sarah Gayle Meech who’s back in town from her new Nashville home. Bluesy faves Far West jumpstart the evening at the free, all-ages Echo show; self-monikered “outlaw folk rocker” Maxim Ludwig & the Santa Fe Seven drive it home til Sarah Gayle takes the stage. Grant’s new booking partner Julie Richmond settles folk/rock/alt-country L.A. newcomer Kelly Pardekooper on the Back Porch along with longtime local boys the David Brothers who’ll ease you into the week ahead. The sippin’ whiskey won’t hurt either. 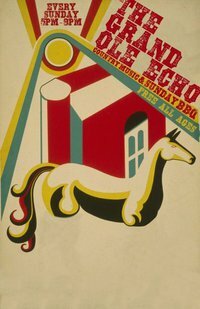 Need to scratch that Americana itch before Sunday supper? The following shows dish up heaping helpings of you-got-my-number and yeah-that’s-right. The Mint’s not foolin’ around this April 1st. Welcome the weekend in sophisto fashion on Friday with roots ‘n brass veterans Royal Crown Revue who helped usher in the Swing Revival movement way back in ’89. These days, Jennifer Keith puts the sultry in chanteuse alongside Crown co-founder/vocalist Eddie Nichols. You may remember these swing kings from their long-time residency at the now-shuttered Derby. Isn’t it time you renewed your acquaintance? 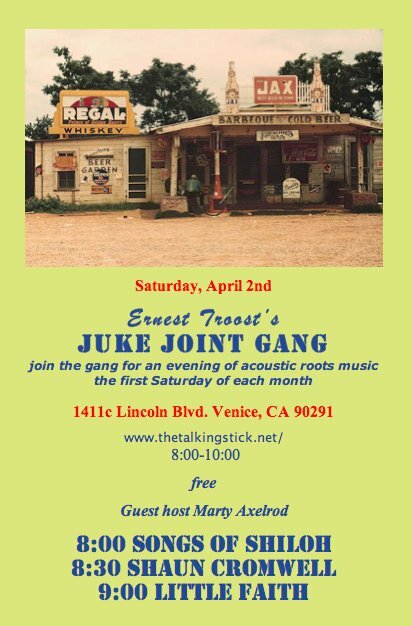 Whoopin’ it up on the Westside this Saturday, Marty Axelrod guest-hosts Ernest Troost’s Juke Joint Gang at the Talking Stick in Venice. Songs of Shiloh, the richly textured country narrative from Axelrod and powerhouse vocalist Nicole Gordon, sets the standard for the evening. Solo bard Shaun Cromwell references roots and ragtime with his fingerpicking and fine-tuned lyrics while Little Faith revs up the jump and jive, tent revival style, at the shank of the evening. Bay City may never be the same. Saturday, April 2, 8:00 – 10:00 p.m.
Next Post NO COACHELLA? NO PROBLEM. You have SO much to do here in town….